February 1, 2019 by Jonathan Chan	in tutorials. While we already know quizzes are by far one of the best ways to generate leads for your business, however not everyone who takes your quiz is necessarily a good fit though. This guide is intended to teach you how you can create a quiz that’ll help you qualify all your new leads. As any good marketer or salesperson knows, it’s not about the quantity of leads you generate but their quality. It doesn’t matter if your new quiz is generating you hundreds of thousands of new leads to your business if none of them are worth getting in touch with in the first place. Typically, the task of qualifying a lead is a time-consuming process that involves much back and forth between a business and the lead to determine if they’re “sales-ready” or if they’re a good fit. Today, I’ll be going over how you can easily set up a quiz that’ll have your leads qualify themselves for you. For this article, we’ll be using the example of what a lead qualifying quiz for an organizational consultant might look like. Before you do anything else, you first need to know exactly what your ideal customer looks like. I don’t just mean knowing what handful or demographics your target audience falls into, but truly understanding what it is that makes them tick and what it is that drives their purchasing decisions. Chances are that your business will have more than one type of ideal customer though depending on the amount of products you have and the services you offer. Make sure you create a profile for each type of customer you have. For our professional organizing consultant, they already know that their target audience is someone that’s interested in learning how to de-clutter and better organize their home. 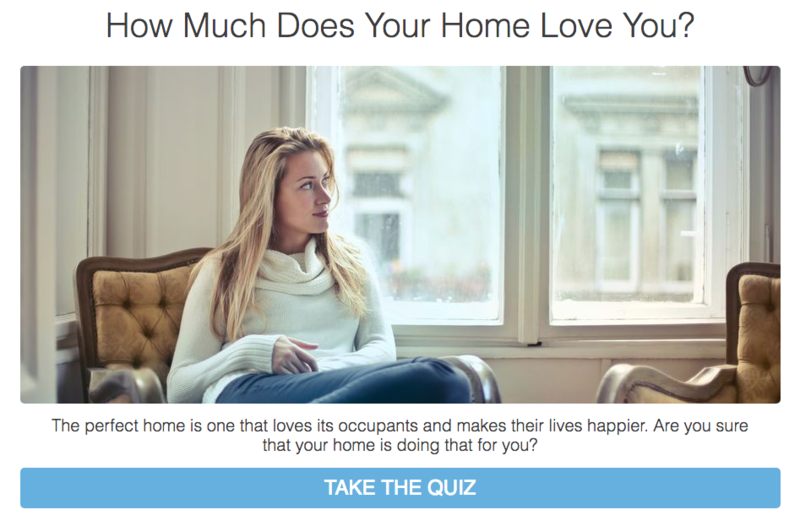 After diving deeper into their customer data though they’ve found that their best customers are either stay-at-home parents or people who have recently moved. By taking the time to define who your ideal customers are not only will you be able to create a quiz that’ll drive more leads but it’ll also help you craft the type of questions that’ll drastically increase the chances of your new leads becoming a customer. While it might seem a little unintuitive at first, the most straightforward way to create a quiz that qualifies leads for you is to start with the results first and work backwards. Once you’ve identified your target customer you’ll be able to start sorting your leads into one of three categories: those who are your ideal customer, those who need a bit more time, and those who will never be a customer. In order to neatly sort your leads into one of these three categories you should use a scored type of quiz. A scored quiz is one where the different answers to all your questions can be assigned a unique point value. At the end, the quiz taker’s result is calculated based on the amount of points they get, with IQ quizzes being the most common type of scored quiz. Based on how many points your leads get at the end of the quiz you’ll be able to segment your audience based on their end result. While the easiest type of scored quiz is an IQ quiz, keep in mind that you don’t have to limit yourself with just one type of quiz. To keep things simple they’ve limited themselves to the three basic results, each one correlating with the three basic customer categories. Those who score highest (your home loves you very much!) are unlikely to require our organizer’s services, however those who receive a low score (your home feels neglected…) are the ideal customer. Remember that when it comes to writing your own quiz results you want to be able to appeal to the quiz taker’s sense of humor, their desire to know more about themselves, as well as providing a good reason as to why they should learn more about their result. As any salesperson worth their salt knows, the key to qualifying leads is asking the right questions. You want to ask questions that’ll allow you to better understand your lead, who they are, what stage of the customer journey they’re in, and whether or not they’re a potential customer. Chances are you already have a set of questions that you ask to help you qualify leads and prospects. As long as those questions don’t require an open-ended answer then you can easily use them in your quiz. Logistically, you want your quiz to have between 5 to 10 questions with each question having at least 3 different answers. This is where the power of a scored quiz is more apparent as you’ll be able to assign different scores to each answer. With a scored quiz there is no “right” answer and all the lead needs to do is pick the option that they agree with the most. Continuing on with our professional organizer example, notice how the question is written in a friendly and conversational tone and how the question reveals a key detail about the quiz-taker. Also, take a look at how the multiple answers to the question all have a different point value and how answers that fit the ideal customer profile are given a lower score. By asking a string of questions like this our organizing consultant is able to gain key information about each lead and whether or not they’re an ideal customer. Pro Tip – To make your quiz more engaging make sure to attach a relevant image to each question and answer if possible. 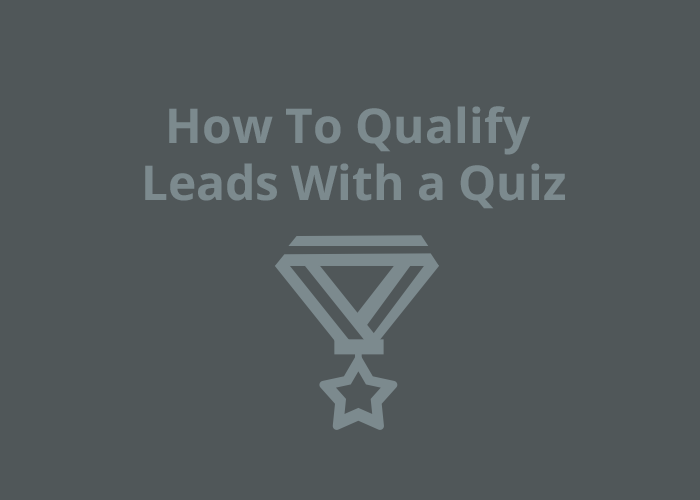 Now there’s no point going to all this effort in creating an amazing lead qualifying quiz unless you’re able to get in touch with your leads in the first place. One of the most effective ways to gather a quiz-taker’s email address is to create a simple email opt-in form. While you could theoretically immediately promote your product or service on the results page and attempt to make the sale, it’s unlikely that the quiz-taker will be ready to buy just yet. Which is why it’s much more effective to ask for someone’s email address instead. According to Campaign Monitor, email is by far the most effective marketing channel out there. With email marketing you have an easy and inexpensive way to continue building your relationship with a lead and continue moving them further down your sales funnel. No one is going to give you their email address unless they have a good reason to. Put yourself in your quiz taker’s shoes and consider what would be the right incentive for them. 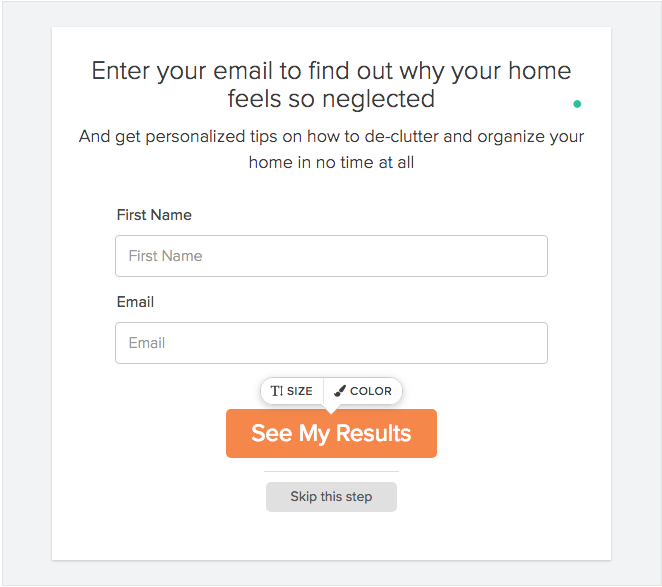 You can see how in the following example how the opt-in form incentives the quiz taker by offering them access to their full results, as well as offering to provide content that’s personalized to their own result. The opt-in form is great because it offers a contextual reason as to why the lead should opt-in and how opting in will help them improve. Now that you’ve successfully segmented your audience and gained permission to send them more emails, it’s time to take full advantage of your email marketing machine. 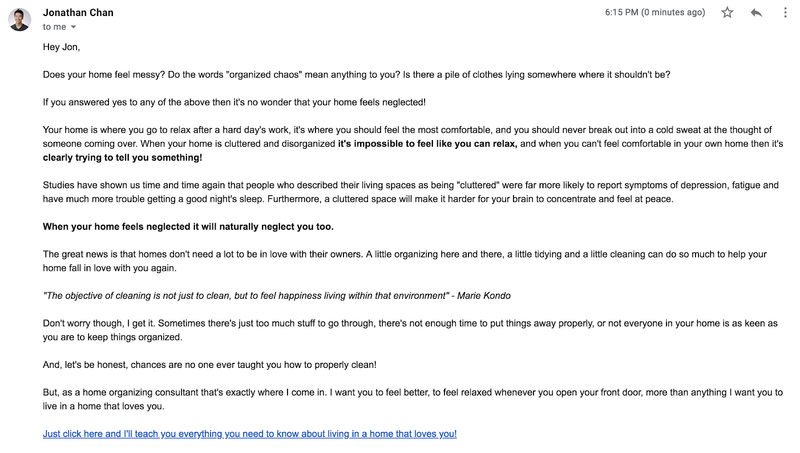 One classic mistake many people make when they’re new to email marketing is using the exact same email sequence for every single lead. We’ve already established that not all leads are the same so it only makes sense that you create a different email sequence for every type of lead. For the leads that your quiz has identified as being ideal customer you can afford to be more aggressive with your marketing messages as they’re far likelier to be sales-ready than your other types of leads. In the following example, take a look at how in the email for qualified leads it delivers on the promise of providing the lead’s full results and ends with a strong call-to-action to take advantage of our professional organizer’s services. Notice how the way that the full results are written and how it places the prospect into the purchasing mindset. While not all leads that come your way are going to be sales-ready, that doesn’t mean that they’re completely useless. Leads that have been segmented into the “those who need a bit more time” category may not be ready to buy right now, but with a bit more nurturing they can be a customer at a later date. Email sequences to these types of leads should be focused on providing valuable content and information. Finally, for the quiz takers who have been identified as someone who will never be a customer you still have a chance to turn them into a brand advocate. You can achieve this by making sure that instead of asking for a sale, their call-to-action encourages them to share your quiz with others. By creating an email sequence for each type of lead that comes your way you can greatly maximize the effectiveness of your quiz’s ability to sell for you. Even better, if you have an email marketing tool like MailChimp or GetReponse you can easily connect Interact with your email marketing client and automate the entire process! Qualifying leads doesn’t have to be this massive task. In fact, as we’ve shown in this guide, it’s actually incredibly easy to have your audience qualify themselves when you have the right quiz. Hopefully, this guide has got some wheels turning in your head about how you can integrate this tactic to your own marketing efforts and how you can drastically streamline your sales process. Create your own lead qualifying quiz right now by clicking the button below!